El Rey del Mundo, meaning "The King of the World" in Espanol, happens to also be the name of a cigar brand that rivals it. 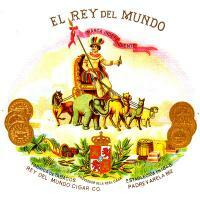 This cigar has a strong flavor with its Honduran filler and binder, and possesses a Sumatran-seed Ecuadorian wrapper. The brand has been rated as high as 91 by Cigar Aficionado magazine.